EZ Transit Pass holders will receive a discounted fare or ride for free, depending on the zone purchased. A complete list of fares for FlyAway TAP and EZ Pass holders can be found here. Purchase tickets in person on the shuttle or online in advance. Two children age 5 and under may ride free with each paying adult. 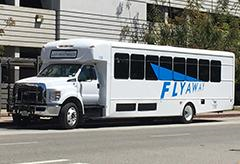 FlyAway travel to and from LAX is a money-saving and time-saving service on one of the most congested traffic routes in the country. Please Note: All sales are final. Tickets are valid 30 days from the date of purchase. Westwood is approximately 12 miles from Los Angeles International Airport (LAX). Taxis (e.g. Yellow Cab) can be picked up at curbside (inside lanes), right outside baggage claim. The cost to go to Westwood will be about $30, including a $2.50 airport tax. Shuttle Services operate continuously and can take you to Westwood for approximately $25. To catch one of these, go to the outer lanes and talk to one of the shuttle dispatchers. They will usually be able to put you on a shuttle within 15-20 minutes. Super Shuttle is one of the larger companies- they have dispatchers at LAX between 08:00-24:00. 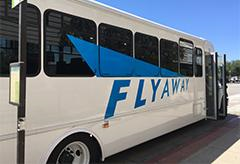 There is regular Bus Service between LAX and Westwood. The best service is via the Big Blue Bus (Santa Monica). The bus will take about 1 hour to get to Westwood (which is longer than a taxi or shuttle because it routes through Santa Monica). To take the bus, you need to take the LAX Airport Shuttle bus to the Transit Center, and there catch the Number 3 Big Blue Bus. That will go all the way to UCLA. Cost for entire trip- only $0.50! Renting a car is reasonably priced at LAX and especially useful if you want to blend in and look like a native. Also useful if you want to cruise the Sunset Strip after hours.